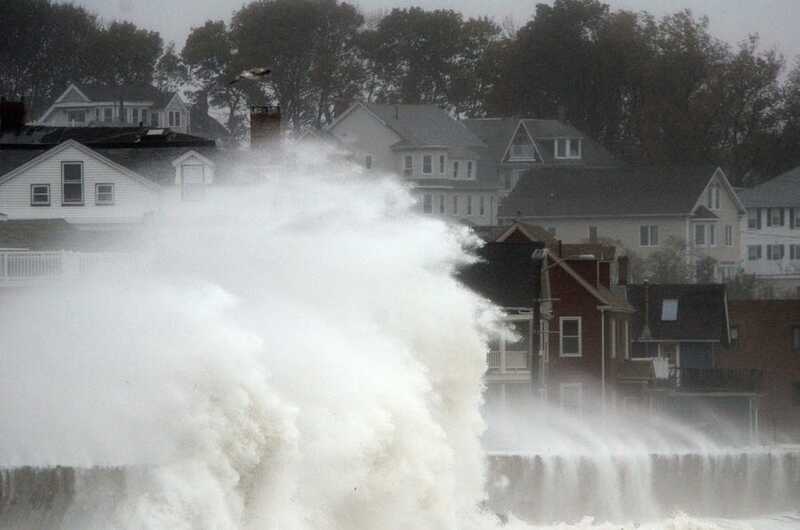 We were lucky, tucked up on a hill here in Boston, so close to the the water -link to picture is 1-1/2 blocks away from my aunt and grandmother’s house! Watching the tarps on the Tobin Bridge being battered by the whipping winds, streets already flooded and trees coming down around me as I headed home from work – popdukes called the day early and we only worked until 2:30 (when the weather seemed to reach it’s worst point for the early part of the day) I had to detour only once to get home. Many people were not as lucky as us. Even a few short miles away they lost power, and had lines down on the streets, some forced to evacuate. I read on Suzanne’s blog (who thankfully was unharmed by Sandy) about supporting people who have been severely affected by the superstorm. Please go see the original post on Creative-Culinary to see the original post. There are many ways that you can send support, one of the easiest ways is to donate to the American Red Cross, and if you keep your receipts, it’s just 2 more minutes you spend on your taxes in the spring. 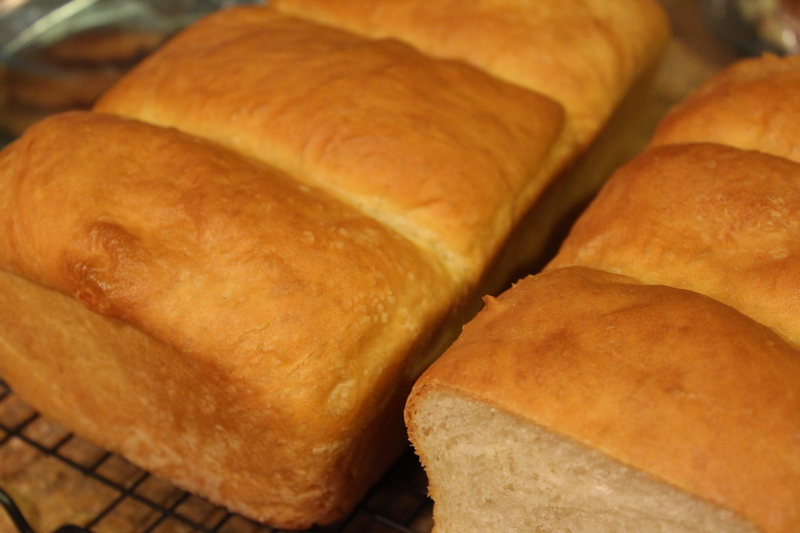 What is better than homemade bread? Not much. When I found this recipe last weekend (yes, it’s been quite a while since I’ve updated, I’ve been seriously overcome with sleepiness lately, I’m so ready to get that extra hour of sleep) I dropped everything that I was thinking about doing/or actually doing and started to make this wonderful looking bread. My search for a great soft, airy bread has been a long one. I just haven’t found something that is good for french toast, sandwiches and doesn’t have too hard of a crust, or one that ends up being hard to cut in a normal thickness slices some of them seem to just disintegrate. The search goes on! In your stand mixer, pour yeast over warm water. Let stand in for about 5 minutes/until the mixture comes alive. Mix in two cups of flour (10 ounces), your shortening (butter), sugar and mix until combined. Add milk and salt, on low speed and little by little ad the rest of the flour until you have a soft dough. Continue by hand, or on your lowest speed setting, adding flour or water until you have an elastic and smooth dough, so it’s not sticky enough to come off on your hands. 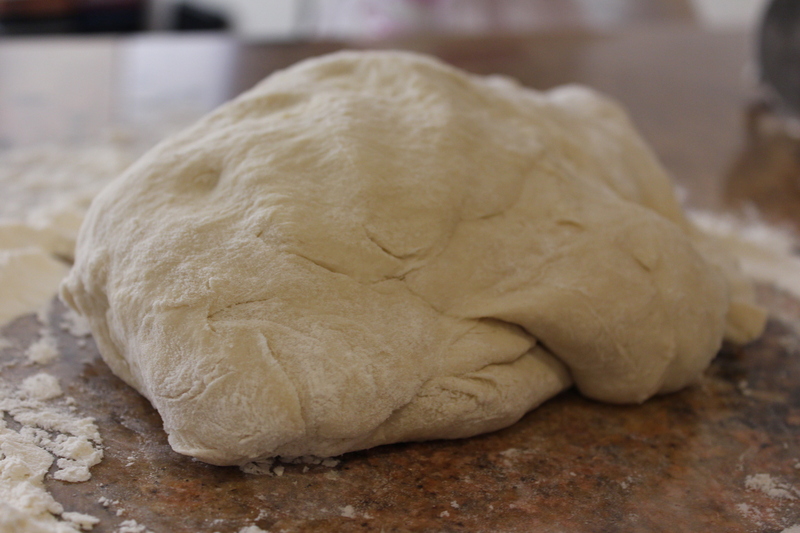 Knead by hand on a floured surface for another 5-10 minutes, making any final additions to get the consistency right. In a clean lightly oiled bowl (olive oil) put the dough into a ball and cover with plastic wrap or a clean and damp kitchen towel, let the dough rise in a warm place until it’s doubled in size – somewhere between 1-2 hours. At this point you can also cover the dough with plastic wrap and put it in the fridge overnight and take it out in the morning to make the bread. Since it makes two loaves, you could make one that day and save the other half in the fridge for the next morning. It can be stored in the fridge for up to 4 days (if you have space for it) but let it come to room temperature, leaving it on the counter for several hours before using. In two lightly oiled 8×4 loaf pans, divide the dough into 6 equal pieces, and lightly roll them into balls. Place three side by side in each loaf pan. 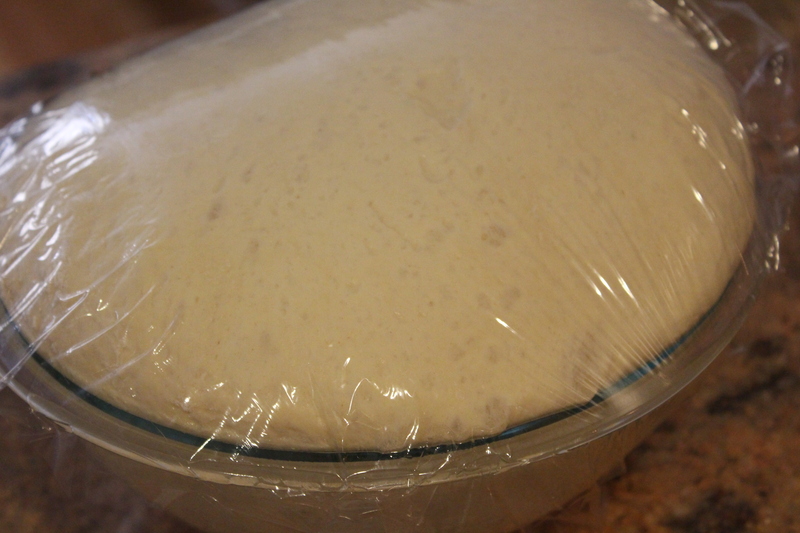 Cover loosely with plastic wrap and let it rise until it’s doubled in size, or the dough is about 2″ above the rim of the loaf pan- this is approximately another 1-2 hours. About 20 minutes before your bread is fully risen the second time preheat your oven to 400F. Bake for approx. 20, and rotate your loaf pans, and bake for another 15-20 minutes. To test bread, tap the bottom of the loaf – if it sounds hallow, it’s ready. To make the crust softer, brush the tops of the crust with a little melted butter. Let loaves cool completely. But, if you are impatient like me you’ll just have to try it before it’s cooled it’s not the end of the world, and won’t fall apart completely, just cut it gently with a sharp knife.